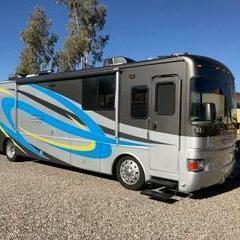 We are planning a two month stay (Dec. and Jan.) in Arizona, first trip there. We prefer to be at a campground on the water, but are finding it difficult to find one without a pet limit. We have 4 dogs, all are small except one and 3 are seniors. Any suggestions? Thank you, Bill and Toni. Bill, check with www.rvparksreview.com. You may have to check put quite a few. Ya, but there are some pretty ones along the Colorado River. Might check out Crazy Horse campground in Lk Havasu City. One thing about the Parker area river is it can be dangerous. 100+ mph boats and tubers don't mix with good results. US Coast Guard has said it is one of the most dangerous waterways in the country. Nothing personal. Was just thinking about a couple & their 4 dogs! I've said it many times on this Forum, I used to race 1000 to 2000HP boats at 140knt +! As DD69 said.